Here is one of our favorite versions of a quintessential Northwest salad. Ready-to-serve salad greens make this super quick to put together. To prepare pears ahead of time, up to one hour before serving, slice the pears and squeeze fresh lemon juice over the wedges to keep them from browning. Arrange on a plate and cover with plastic wrap until ready to toss the salad. For salad: Preheat the oven to 350 degrees. Spread the nuts in a single layer on a rimmed baking sheet. Bake until barely golden, 7 to 10 minutes. Let cool. Place the salad greens, currants, and hazelnuts in a large serving bowl. 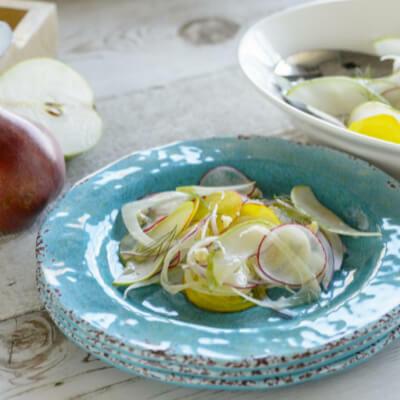 Prepare the blue cheese and pears and set aside. For dressing: In a small jar with a tight-fitting lid, combine the vinegar, apricot spread, olive oil, salt, sugar, and pepper, to taste. Cover tightly and shake vigorously to blend the ingredients. Taste and adjust the seasoning. When ready to serve, give the dressing a last-minute shake and pour over the salad. Toss gently and divide among 4 plates. 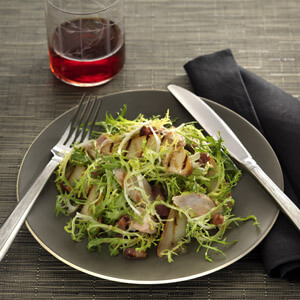 Scatter the cheese over top and arrange 4 pear slices around each salad. Serve immediately.